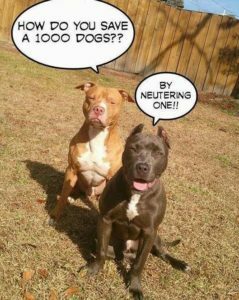 February is National Spay/Neuter Awareness month. Awareness can sometimes be uncomfortable. For instance, are you aware that 2.7 million dogs and cats are killed in American animal shelters every year? Are you aware that many of these deaths are unnecessary? 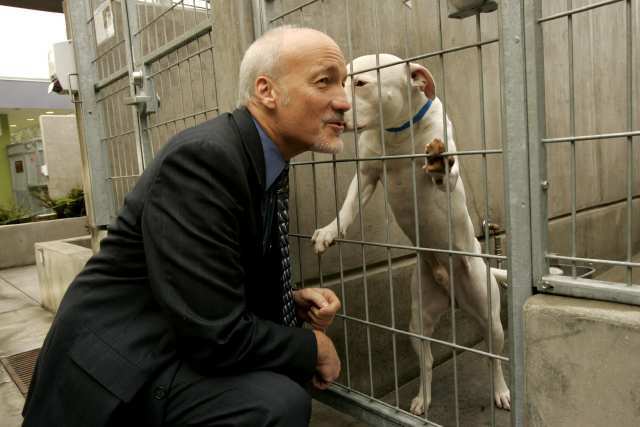 Are you aware that few societal problems are easier to solve than pet overpopulation? It’s true. While most of us say we understand the importance of spay/neuter programs, too many of us still find excuses to not spay/neuter our own pets. This inaction often directly contributes to the 2.7 million deaths in American animal shelters every year. Let me try to illustrate the scope of the problem. Imagine 7,776 beans in a jar. This is the number of offspring a single un-spayed dog can produce in five-years. That’s right, one un-spayed dog and her offspring can produce over 7,776 puppies in just five years (calculating six female puppies per litter bred every 12 months). This awareness helps us understand how easily pet overpopulation can get out of hand. The reason more than 2.7 million cats and dogs are euthanized in shelters each year is due to our reluctance to have our own pets spayed or neutered. The Yavapai Humane Society (YHS) urges pet guardians to do the right thing – get your dog or cat fixed. To help encourage you to make this life-saving decision, let me help you overcome some of the reasons used for not making the life-affirming decision that directly helps solve the pet overpopulation problem in our community. Are you aware of the many benefits a spayed or neutered pet enjoys? 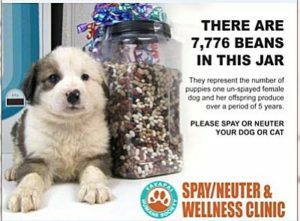 Spay/Neuter neutralizes the many bothersome behaviors of pets in heat, such as howling, spraying, fighting, and the urge to roam and the risk of getting lost. Are you aware that spay/neuter surgery helps keep your pet healthier? A spayed or neutered pet is protected from certain cancers. Are you aware that, according to a USA Today report, a neutered dog lives 18 percent longer than an un-neutered dog? And a spayed dog lives 23 percent longer than an un-spayed dog. This reason alone makes spay/neuter a no-brainer. Were you aware that having your pet spayed or neutered could result in so much good? Another reason a pet guardian might choose to not have their pets spayed or neutered is the cost. But are you aware of the very low cost of spay/neuter at the YHS Spay/Neuter Clinic? And when you schedule an appointment in National Spay/Neuter Awareness month you will receive an additional 20 percent off our already low cost to have your pet spayed or neutered. Call the YHS Spay/Neuter & Wellness Clinic today to schedule an appointment in February. Low-cost spay/neuter surgery is offered by appointment Tuesdays through Thursdays all year round. When you call, ask if you might qualify for a free spay/neuter surgery through the YHS Big Fix program. February is our one chance each year to “beat the heat” and reduce the number of pets able to multiply the number of shelter pet deaths throughout the rest of the year. There are few societal problems easier to fix than this one. All you have to do is pick up the phone to schedule your pet’s appointment, thereby helping to save lives and solve this problem. Beat the heat; call before the puppy and kitten season. Schedule an appointment in February and you not only save lives, you save 20 percent off our already low prices!